If you have a car and you are looking for an activity for your off day from the parks, visiting one of the many Florida beaches within a 1-3 hour drive is a great option! Since Orlando is situated near the center of the state (East/West wise), you have the choice of visiting a beach on the Atlantic Ocean to the East or one on the Gulf of Mexico to the West. Each destination has its own allure. East coast beaches are truly on the ocean. So, if you’ve never been to the ocean, this may be what you’re after. Keep in mind that the Atlantic can be a bit rougher than the gulf usually is, so if you’d like gentler waves, the gulf coast may be for you. 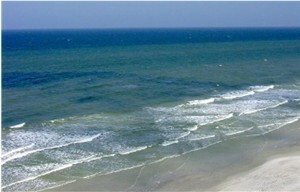 The beaches on the gulf coast are generally softer white sand than the hard packed gray sand on the ocean side as well. And, the water of the gulf is likely warmer than that of the ocean. East coast beaches are generally 30 minutes to an hour closer to Walt Disney World than gulf coast beaches. Cocoa Beach is about an hour away and likely the closest beach to Walt Disney World. The area features twelve miles of beaches and has activities including airboat rides, fishing excursions, swimming and shopping and entertainment. Daytona Beach is one of the more popular beaches on the ocean coast. Some of the activities that you can find there include swimming, fishing, surfing, sail-boarding, skiing, and beach driving. Keep in mind that in February, the Daytona 500 auto race is held and the area is extremely crowded during this time. New Smyrna Beach has 13.3 miles of beaches bordering the Atlantic. The area features a marine discovery center and in June/July, there are nightly watches for migrating loggerhead turtles who come ashore to lay their eggs. Port Canaveral Jetty Park features camping, fishing and swimming. Caladesi Island features white sandy beaches, ideal swimming, snorkeling, scuba diving and shelling. The state park features a three-mile nature trail. The island is reached via a ferry that departs from Honeymoon Island. Clearwater Beach hosts Pier 60 Park where almost every water sport and beach activity imaginable is available. Soft sandy beaches await you. The beach is located at the west end of State Road 60. Treasure Island Beach is sometimes referred to as the “Jewel of the Gulf Coast Beaches” and is a small barrier island on the west coast. Many water sports are available and the area features several festivals at various times during the year. From I-275 turn west onto Central Avenue across the Treasure Island Causeway until it ends at Gulf Boulevard. update with tips and informative articles. © Since 1997 INTERCOT - a Levelbest Communications Website. This is not an official Disney website.